As well as appearing in a variety of colours, horses can also exhibit numerous markings, usually distinctive white areas over a darker base colour. 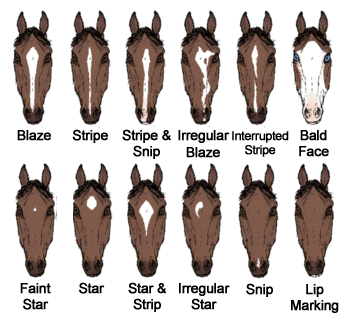 This article will explain some of the main equine markings. Facial markings are usually described by shape and location. If there is more than one marking they are typically named seperately. Blaze : a wide white stripe down the middle of the face. Strip / Stripe : a narrow white stripe down the middle of the face. Bald Face : a very wide blaze, extending to or past the eyes. Star : a white marking between or above the eyes. Snip : a white marking on the muzzle, between the nostrils. Faint : White hairs as normal marking but without underlying pink skin. Interrupted : A broken or incomplete marking. Connected : Sometimes used to describe seperate markings that run into each other. Irregular : A strip or blaze that is not straight. Lip markings : Lip markings do not have specific names but are referred to by location, e.g. 'chin'. Leg markings are usually described by the highest point of the horse's leg that is covered by white. Stocking : White marking up to knee or hock, or even higher. Sock / Boot : Higher than fetlock but not as high as knee or hock. 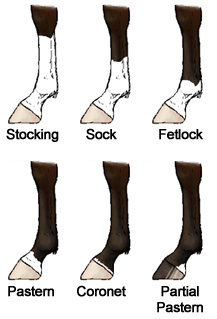 Fetlock : Up to and including fetlock. Pastern : Above the hoof but below the fetlock. Coronet : White just above hoof ( < 1 inch ). Irregular : Marking of roughly regular hight but with uneven edges. Height is classified from highest point. Partial : When marking extends only up part of leg. Bend-Or spots are dark patches. Ermin Marks are black marks on top of a white marking. Individual patches that are not typical markings and are not large or regular enough to make the horse 'coloured' are known as body spots and are described by location, e.g. 'belly spot'. Horses may develop markings over areas of scar tissue or nerve damage, or where certain items have been worn regularly, e.g. 'saddle marks'.